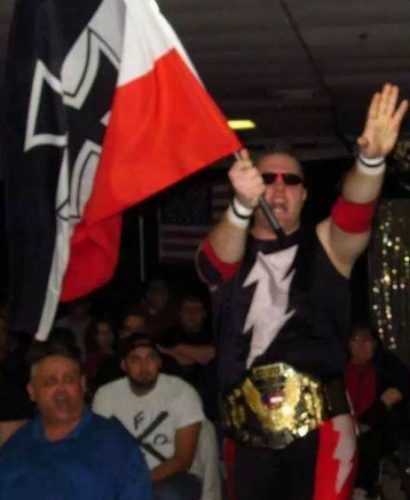 Pennsylvania independent wrestler, Kevin Bean, a 36-year-old teacher who moonlights as Blitzkrieg, the German Juggernaut, was featured on Michael Smerconish’s CNN show after he was disciplined by his school. Bean has been in his teaching position since 2004, but at issue is the character he plays at his ‘other job’, where he portrays the mannerisms of a Nazi soldier – complete with goose stepping, symbolism and salutes. The titular host of the weekend, news-discussion program, Smerconish, asked his audience if the teacher had the right to act in this manner outside of his regular school activities, Smerconish also questioned if the Spring-Ford area school district had the right to suspend, or even terminate, him. A Tweet by ProWrestlingSheet‘s Ryan Satin was mentioned in the piece, and shown in a graphic. It was cited as one of the reasons that Bean’s Nazi gimmick drew the attention of school officials.